(NaturalNews) By now, almost everybody knows that conventional milk products routinely contain synthetic hormone chemicals, blood and pus. So most people look for alternative milk products, and while soy milk was popular for many years, all the nasty truths about soy (GMOs, deforestation, etc.) have caused a major shift to almond milk over the last 3 years or so. Today, most health-conscious people are drinking almond milk, oat milk or some other non-milk, non-soy milk product. Some are also drinking raw cow's milk which is also quite healthy because it's not pasteurized. (Personally, I drink a small amount of raw goat's milk, adding it to my daily smoothies.) Thanks to a company called Blue Diamond, non-organic almond milk is readily available in grocery stores, too. Almond milk has become the top choice for three reasons: 1) Almonds taste great. They have natural sweetness and a creaminess. 2) Almonds are super healthy. The plant-based fats are far better for you than homogenized milk fats. 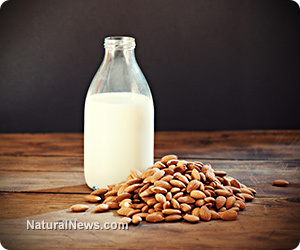 3) Almonds are affordable and readily available, making almond milk reasonably affordable, too. Plus, for all of us ethically-conscious people, almond make is made without subjecting animals to the kind of horrendous conditions we've seen in some dairies. The whole almond situation got weird a few years ago when the USDA conspired with California kleptocrats to destroy the California almond industry by mandating that all commercially-grown almonds be killed with deadly fumigation or exposed to high levels of radiation. This is the USDA's idea of "food safety." Poison it or nuke it, then sell it to the people so they die from degenerative disease or radiation poisoning. These rules are still in effect today, meaning that all the commercially-grown almonds produced in California (which is something like 95% of the U.S. production) are poisoned or irradiated. So the first piece of advice I'll offer you today is to make sure the almonds you're buying aren't just "organic" but are also non-irradiated and non-fumigated. You really have to do your homework on this. I'm sorry that we don't currently carry imported almonds in our own store, but we're looking into some sources and hope to have some later this year. To start, soak the almonds in water for 6 hours or so. You can also do this in a hurry by skipping the soaking step, but soaking them results in better milk extraction. Simply place the almonds and the water in the blender, then blend into a nice milky liquid. How much water should you use? As a general rule, use 3-4 cups of water for every 1 cup of almonds. Adjust it according to how thick or thin you like it. Now you've got almond milk! Refrigerate it and it's good for a couple of days, but as with all things raw, it's best to consume it sooner rather than later. Here's a video I filmed a million years ago that shows this process in more detail. This was before we switched over to NaturalNews.com! Did you know you can also JUICE with a nut milk bag? You don't even need a juicer! It's easy: Just blend up all your favorite fruits and vegetables. Pour the thick liquid into the nut milk bag and squeeze out the juice. This is a powerful green juice that's made quite tasty by the pears and the lemon. The lemon is especially important because it masks the bitterness of the green leafy vegetables. How much of all this should you use? Play with it! For starters, use only a small amount of beet but a large amount of celery and pears. Use a medium amount of kale and parsley. Use a whole lemon. You can also replace pears with apples, if you want. Add a tiny amount of ginger if you want to spice it up. Some people even add some cayenne pepper, although I'm not personally a fan of that. The only downside to making your own nut milk or fresh juice is that it takes time. This isn't fast food; it's slow food. It's also the kind of food that will prevent disease and keep you alive and healthy for a long, long time. If more people around the world made some daily juice instead of barreling through the fast food drive-through, we wouldn't all be dying of cancer and heart disease. Juicing is truly the answer to nearly every chronic degenerative disease that now devastates every industrialized nation across our world. Remember, though, when it comes to juicing it's crucial that you buy organic ingredients. You don't want to be juicing pesticides, obviously, as the whole point of juicing is to nourish your body and eliminate toxic chemicals. In case you're wondering, YES, the ultimate solution in all this is to grow your own juicing vegetables, then juice them. As you may know, I'm currently constructing a fairly large-scale aquaponic food production system with precisely this goal in mind. My goal -- which might even be your goal as well -- is to harvest living fresh vegetables and fruits each morning, then juice those within minutes, and drink them immediately. This is the ultimate food for health and longevity. It's full of bio-energy, digestive enzymes, phytonutrients and much more. Now, obviously, this is not going to be practical all the time due to seasons and outdoor temperature variation, so do the best you can given your circumstances. You might only be able to grow 20% of your juice ingredients, but that's better than 0%. Or if you have the money for it, build a greenhouse and greatly extend your growing season. The ultimate goal, really, is to grow your own food and medicine and not have to buy anything at the grocery store except for staples such as salt or baking powder. The closer you can get to divorcing yourself from the commercial food industry, the healthier you'll be (by far). Enjoy your almond milk and fresh juice!